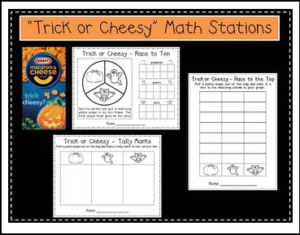 Grab a few boxes of Kraft’s “Trick or Cheesy” Halloween Mac and Cheese and you’ll have three instant games to use in your Math Stations. Skills include graphing, making tally marks and using tens frames. Happy Halloween!